Who are the Madhesis, why are they angry? New Delhi conveyed an easing of the protests to Kathmandu over the weekend, and a degree of normalcy is expected to return this week. Last year, Narendra Modi snubbed a Nepali parliamentarian who was unhappy that Madhes had not found a mention in the Prime Minister’s speech. Modi’s message was clear: India would treat Nepal as an integrated whole of both mountain and plains parts. 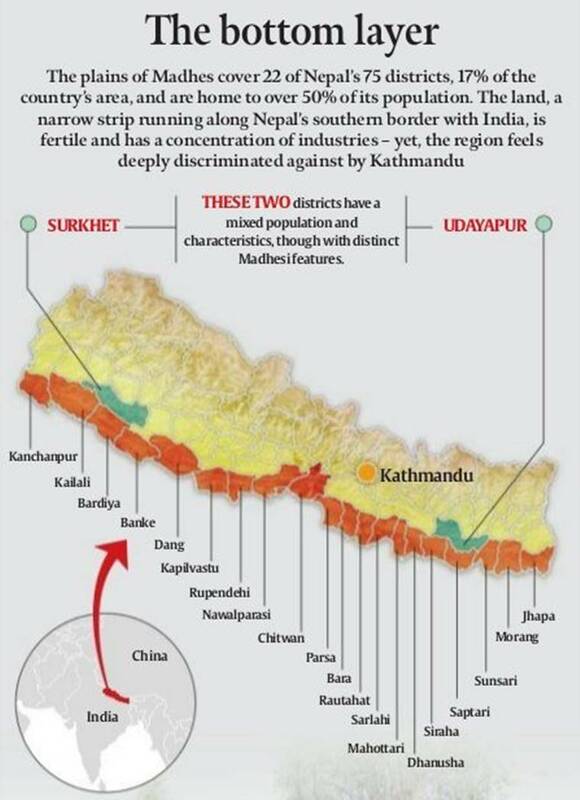 This was at odds with India’s line in the Terai over the past few years. The conflict between the plains and Kathmandu manifested itself most recently after the promulgation of Nepal’s new Constitution — in the two-week Madhesi blockade of goods, which appeared to have India’s unofficial backing. New Delhi conveyed an easing of the protests to Kathmandu over the weekend, and a degree of normalcy is expected to return this week. A strong political movement seeking enlarged participation of the Terai in Nepal’s politics and policymaking emerged in 2007, decisively setting the agenda for federalism. The movement has since seen ruptures — from three parties at the time of the first Constituent Assembly, there are 13 now — and the Madhesi groups are no longer as strong politically. The Madhesi question underlying the politics of victimhood is complicated: Given the diverse demographics of the Terai, is Madhes a geographical entity or an ethnic entity? The Tharus, the largest group of original settlers, are some 16 lakh in number. Other hill castes who have been living here for several generations are around 60 lakh. Those who are referred to as Madhesis number around 56 lakh (2011 Census). Tharus do not like to be called Madhesis, and those of Hill origin are still identified as Pahadis. The Madhesis have castes and ethnicity similar to Bihar and eastern UP, with frequent inter-marriages between families on either side of the border. The Madhes has historically been part of the larger Mithila region. Most of the affluent of the Terai are educated in India, and the democracy on the other side of the border has kept levels of political awareness high. Most of the 11 Indian ambassadors to Nepal since 1990 have been from Bihar — and about half of them belong to a sizeable caste in Nepal’s Terai. Their interest, and visible concern, in the region’s politics has attracted suspicion in Kathmandu. Parmanand Jha a Maithil Brahman. The Madhesis themselves have been wracked at times by a tussle between ‘migrant Madhesis’ and the ‘Dhartiputras of Madhes’. “Our struggle is not to seek more rights for naturalized citizens in Terai,” said Matrika Yadav, once a militant Maoist leader who is currently part of the Madhesi movement. The question of Terai rights was raised first by Bedananda Jha in the early 60s, but his movement ended with his co-option in the power centre. He became a Minister and Nepal’s ambassador to India in the late 70s. After the advent of democracy in 1990, leaders like Gajendra Narayan Singh demanded a fair share to Madhes. Since 2007, more regional parties, aggressive and vocal, have come into the picture. The Madhes-centric leaders were discredited after failing to push their agenda during their time in power in 2008. They started to press for greater autonomy as per the March 2007 agreement only after they had fallen out with the major parties over power-sharing in late 2014. India has being criticised in Kathmandu for having sided with the “discredited” Madhesi leaders, and shutting its eyes to the blockade that hurt the aam Nepali. Over a quarter century ago, a 15-month blockade by India led to a political change in Nepal and, subsequently, the advent of democracy. The current situation has followed India’s disapproving response to the new Constitution. The difference this time is that Indian opinion is divided more sharply — several former diplomats have criticised New Delhi’s policy, with some accusing it of attempting a Sri Lanka in Nepal: promoting an ethnic divide and taking sides, with potentially dangerous consequences. 1 Simply put: UP NRHM scam probe touches Maya, what happens now?